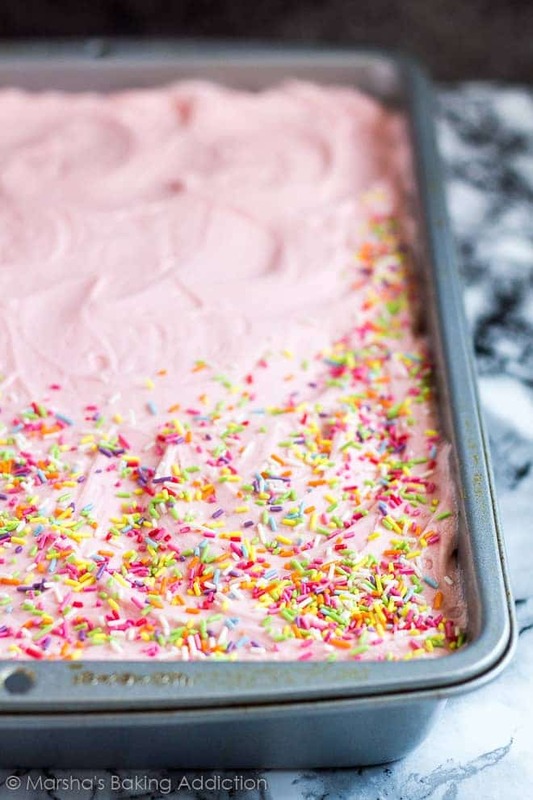 Funfetti Sheet Cake – Deliciously moist and fluffy vanilla sheet cake, loaded with sprinkles, and topped with a creamy vanilla buttercream frosting! I am a big fan of Funfetti recipes. I love all things sprinkles, and I LOVE the burst of colours throughout the desserts. 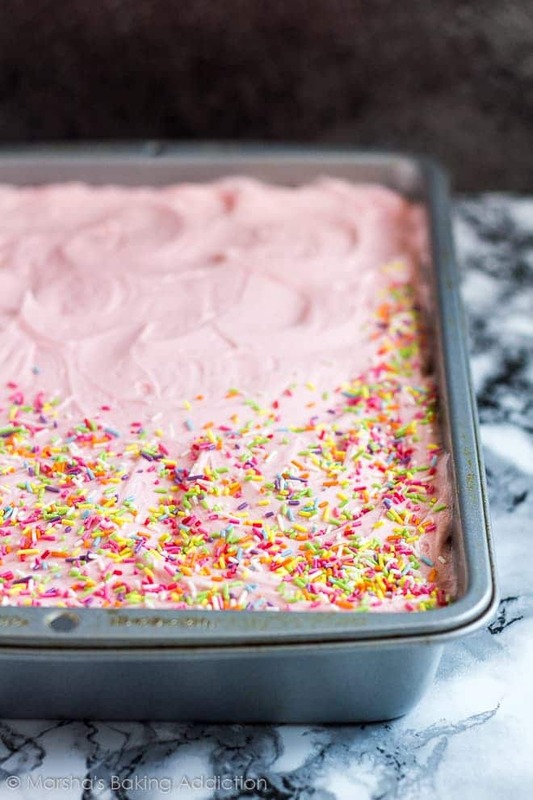 So today, I bring you a recipe worthy of all the birthday parties – Funfetti Sheet Cake! I love making sheet cakes! They’re so quick and easy to throw together, and much more simpler than filling and frosting a layer cake. You still get a nice, thick layer of moist and fluffy cake, topped with plenty of sweet buttercream frosting. 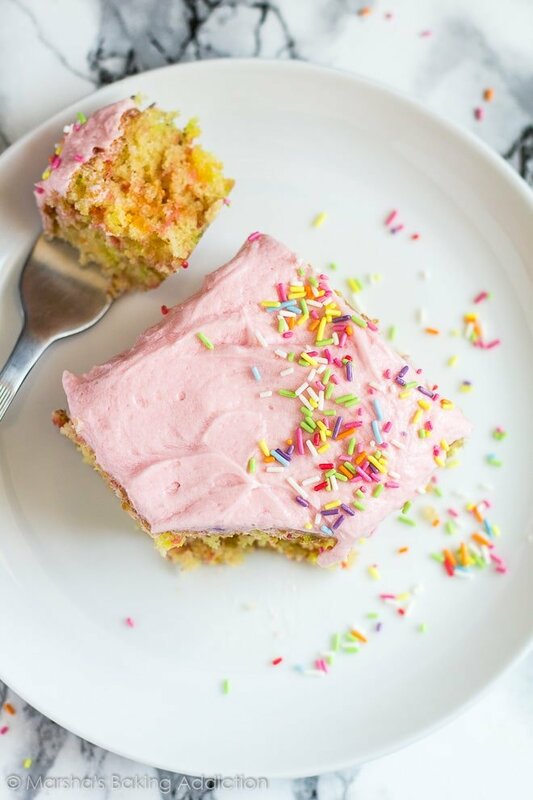 Add lots of sprinkles, and you have yourself the perfect addition to any party! 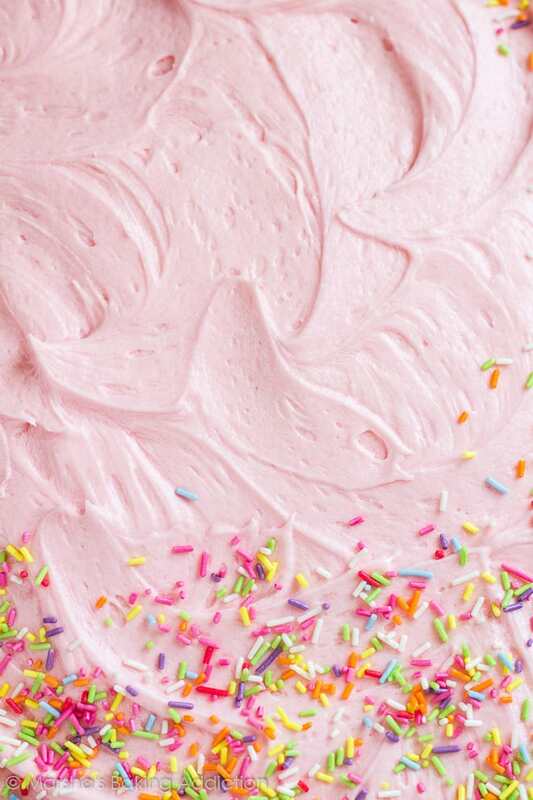 I made the buttercream frosting pink for more pop of colour, but you can dye it any colour, or simply leave it out! 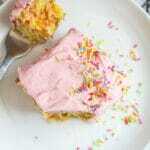 More sprinkle loaded recipes to try! 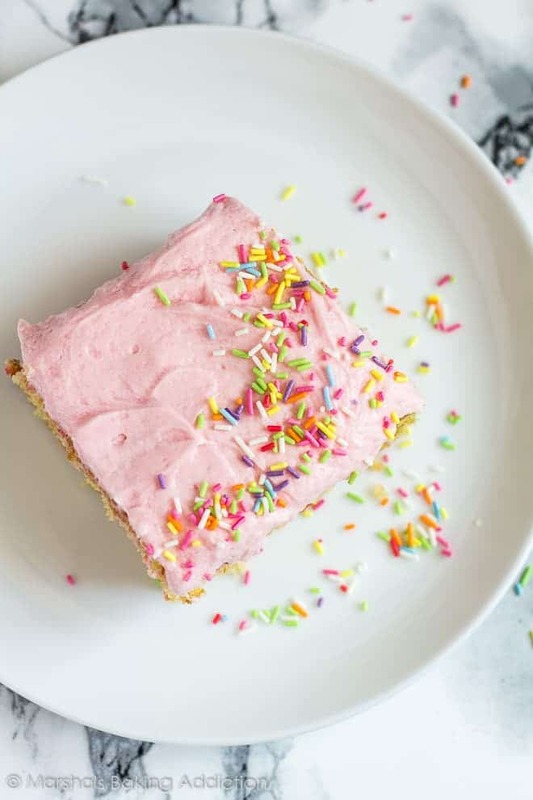 Deliciously moist and fluffy vanilla sheet cake, loaded with sprinkles, and topped with a creamy vanilla buttercream frosting! Preheat the oven to 170C/325F/Gas 3. Grease a 13x9-inch pan, and set aside. Whisk together the eggs. Add the sugar, and whisk until combined. Add the vanilla extract, butter, and yogurt, and whisk until combined. Gradually fold in the dry ingredients. Gently fold in the sprinkles. Pour the batter into the prepared pan, and spread out evenly. Bake for 20 - 25 minutes, or until a toothpick inserted into the centre comes out clean. Allow to cool completely in the pan on a wire rack. Using a handheld or stand mixer fitted with the paddle attachment, beat the butter on high until pale and creamy - about 5 - 10 minutes. Add half of the icing sugar and, starting on low speed and working up to high, beat until light and smooth. Add the remaining icing sugar, and beat, starting on low, until smooth and combined. Add the milk, and vanilla, and beat until light and fluffy. Add a pinch of salt if the frosting is too sweet. 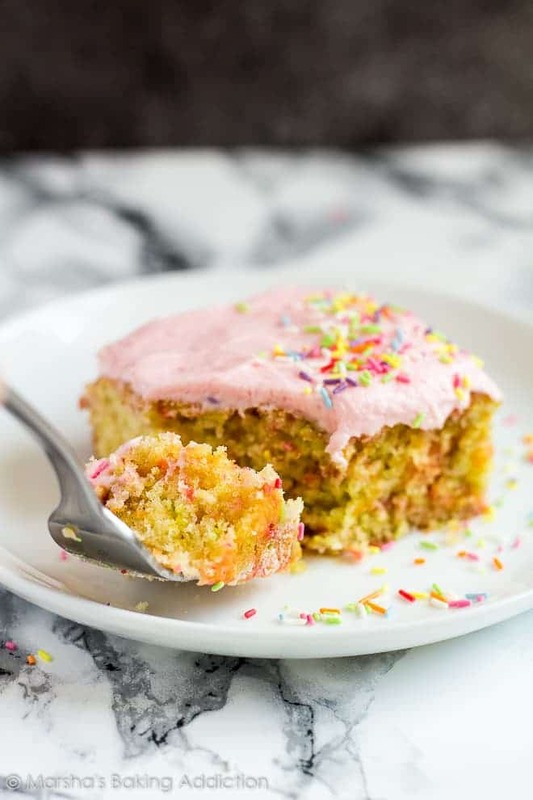 Spread the frosting evenly over the cooled cake, and garnish with sprinkles. Slice and serve! *Make your own cake flour! Measure out 2 and 1/4 cups (280g) of plain/all-purpose flour, remove 4 tablespoons, and replace with 4 tablespoons of cornflour/cornstarch. Sift well. After the cake has cooled completely, it can be wrapped in clingfilm and refrigerated/frozen overnight, ready to be frosted the next day. The frosting can also be refrigerated overnight. Frosted or unfrosted cake freezes well for up to 2 months. I love sheet cakes as well. Less fuss involved and this sheet cake looks so cute! I love the light pink frosting. Cake flour is lighter than plain/all-purpose flour, they are both correct 🙂 Enjoy!